A group for everything from the Victorian Age (1837-1901) including Steampunk and Neo-Victorian. Self-Injury Among Victorians? A Picture of Misery. Eliza was admitted when she failed to keep up with the demands of a single-servant house - that is, she was unable to perform the task of tending, stocking, cleaning, lighting and banking the fires and lamps in all twenty rooms during the winter months all by herself. She began to self-injure and when admitted, her records reported that she ‘has frequently tried to injure herself by knocking her head against doors and walls, and has slept in the padded room on this account’. A few months later, Eliza was transferred to the 'Incurables Department' and no further record of her is known. About three o’clock yesterday afternoon a poor man who used to sell hot pies, &c, went into one of the infamous brothels in Dover-Street, to offer his pies for sale, when he was immediately surrounded by the wretches who inhabited it, his pies were soon picked up and devoured by them, they then hooted and laughed at him, setting him at defiance, and refusing to pay for his pies. They then struck him unmercifully with quart pots, a poker, &c, until he was quite senseless and left for dead, of which they only made sport for some time; but at length not recovering, the case became publicly known, and the poor man was carried home to his house, 14, Tower Street, facing Bethlem, but expired in a few minutes: a surgeon was sent for but could render no assistance. One woman, who is charged with the mortal blow, was secured and lodged in the watch-house. Opium! The greatest gift a medical cabinet could have! Opium, of course, is made from the Opium Poppy (Papaver Somniferum) as are a whole range of drugs, both medicinal and illicit. 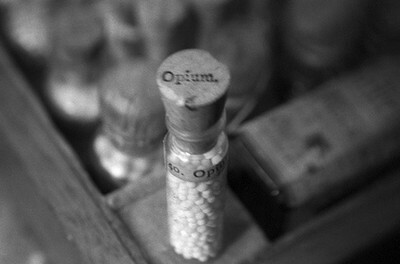 Various opiates, such as laudanum, were once widely available. In Victorian times, anyone could purchase a bottle of laudanum for their pains, either physical or emotional, and opium was sold in large cakes wrapped in brown paper. From this, a mixture of sugar, opium and water could be made and this was frequently given to babies and small children to keep them quiet and still while their parents were busy. This naturally created a number of very young addicts, and in the 1800s there are numerous accounts of children as young as five attempting to buy bottles of laudanum for their own use. Today, opiates are strictly regulated drugs because of their high potential for abuse. Personally, I find this a shame and an over-exaggerated fear. The knowledge of the proper applications of opiates are no secret and have been well-known since ancient times. That doctors persist on prescribing these new 'wonder' drugs, when no-one has really any idea what they do, as they are only 'thought to work' in a particular fashion, seems impossibly reckless. Moreover, nothing kills pain quite like opiates. There is no safer, more readily available, widely understood drug for the treatment of acute and chronic pains than the extracts of Papaver sap. As a long-term sufferer of chronic pain (thankfully cleared up now through surgery) I understand both the great blessing of being temporarily painfree and the struggles involved to find a doctor who isn't too afraid of addiction to prescribe you a few pills. But this is a blog about history, not the modern medical field. Driven ashore at Porthminster Beach (St Ives), October 17th, 1907.
later the Lizzie R. Wilce and the Mary Barrow also had to beach here. Eliza Griffin, admitted to Bethlem 'Bedlam' Mental Hospital for 'acute mania', 1855.